Screenshot of a TPUSA email received by a Rider University student in April. Sophomore musical theater major Dylan Erdelyi approached a table set up by Rider’s Chapter of Turning Point USA (TPUSA) at an event in the beginning of the fall semester to introduce himself. He quickly chatted with individuals at the table and left. He signed no list. He showed no interest in becoming a member. Days later, according to Erdelyi, he received an email from the organization welcoming him as a member of TPUSA. This experience is not unique to Erdelyi. Sophomore film, television and radio major Demara Barnes attended the organization’s “White Privilege is a Myth” event on April 2. Barnes received a ticket from online and when she arrived at the event, her student ID was swiped and she was given a wristband to enter. Eight days later, she received the same email as Erdelyi, informing her that she was a member of the organization. On the organization’s Bronc Nation page, which contains information about all organizations at Rider, there are only nine listed members. Barnes, who provided The Rider News with the email she received from TPUSA, emphasized that she was not interested in joining the club. The email, which was sent from the national TPUSA organization and signed by Founder and Executive Director of TPUSA Charlie Kirk, indicates that Barnes signed up for the organization. It also indicates that TPUSA at Rider is sharing event attendance records with an off-campus political organization, without notifying students in advance of their intent to do so, raising significant privacy issues. 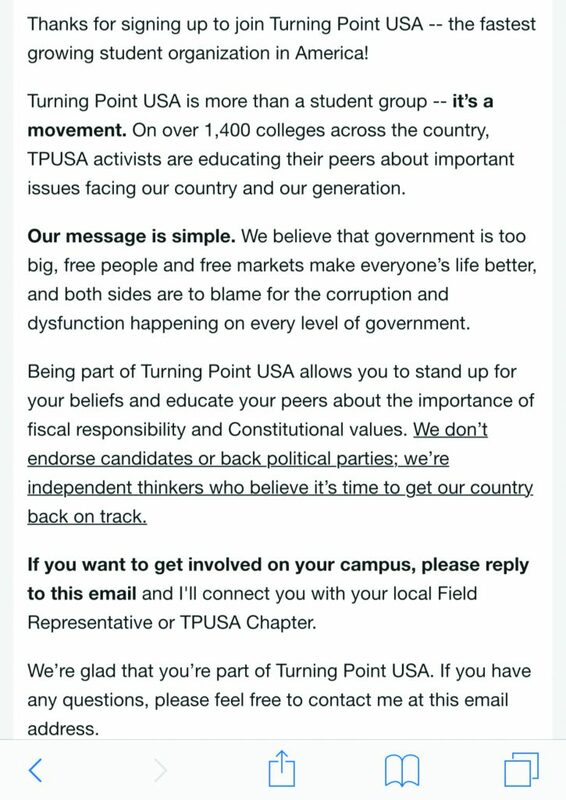 “Thanks for signing up to join Turning Point USA — the fastest growing student organization in America,” reads the email. Freshman public relations major Xyaire Merriweather shared an almost identical experience with TPUSA as Barnes. Merriweather also attended the “White Privilege is a Myth” event and received the same email as Barnes. Aminov explained that the emails of attendees at events are aggregated by the national organization during the RSVP process. Aminov went on to state that he thinks this method is commonly used by organizations and that the sharing of student information with a national organization is not a violation of student privacy. The Rider University College Republicans president and senior marketing, international business, and sport management major Alex Solomon said that he believed as long as there is an opt-out option for emails advertising future TPUSA events, there is nothing wrong with such an email list. However, he took exception to individuals being labeled “members” after attending an event. “I believe that just because someone comes to an event that you host, especially an event such as the one TPUSA hosted at the beginning of [April], it is wrong to consider them members of your club,” said Solomon. According to Solomon, The Rider University College Republicans takes advantage of the SGA Clubs and Organizations Fair to recruit new members. Individuals must explicitly sign up to be a part of the club and when the individual attends a club meeting he or she will be given membership. Solomon, who has led the club since April 2016, highlighted an event where The Rebovich Institute for New Jersey Politics hosted Newt Gingrich in the spring of 2017. The Rider University College Republicans hosted an after-party, which Solomon labeled “a major success for both Rider students and outside guests.” No one who attended was assumed a member. “Students who attended that, although they had to sign in, were not added to our membership roster, as that would not be right,” said Solomon. Erdelyi, Barnes, Merriweather and others expressed no interest in becoming members of TPUSA. In most cases, they attended events on their college campus, which Aminov describes as “the frontline of the battle against liberalism,” and left, unknowingly, members of the organization.